Two days before we left Ethiopia, we went to the bank and transferred funds to begin the building of two new churches: Bassa and Besheno. 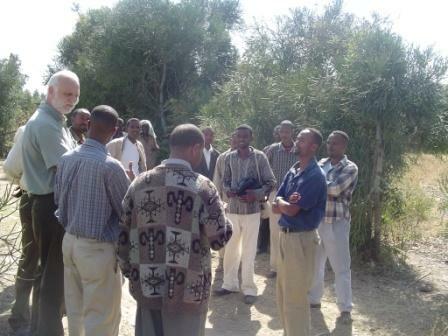 We had already visited the land at the Bassa church. It is a nice rectangle. 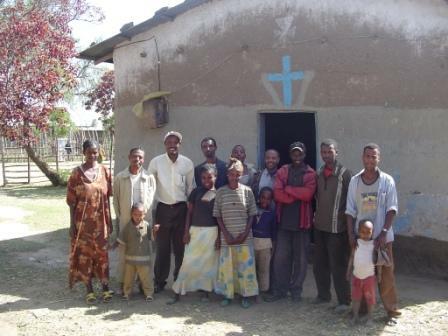 Muze is the founder and primary leader of this little congregation; he donated this large portion of his land to build a church. Muze’s father is a community leader. When Muze first converted, his father would publicly beat and disgrace him in front of all the Imams. The day of our visit, however, we crossed the road to the home of his father. Sitting at the base of a tree was an old man. He was very hard of hearing, and he had suffered a stroke. Muze asked us to pray for his father. The old man willingly, eagerly submitted to the prayer time. As we stood over him, our hands falling on his head and shoulders, I was thinking of the sovereignty of God. Just a few short years before, this man ruled with an iron fist. Now he was weak and old. And yet God’s grace and love were still present. How patiently our Lord waits for us! Many times people delay to come to Him for salvation; many other times we delay to obey Him as Lord. How patient He is; yet a Day of Judgment will come! Let us beware, and heed Him while He is still patient. A brotherly hug with Muze. 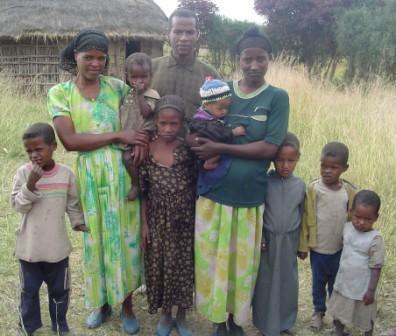 Muze and his family. 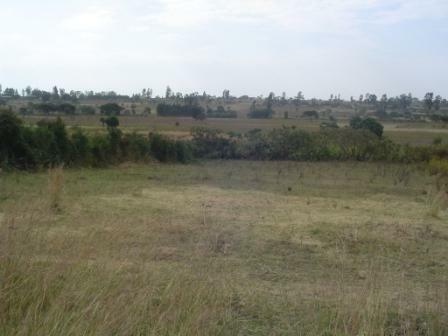 The land Muze donated for the meeting hall. Besheno is far to the north of Alaba Town. The leaders told us it was far too dangerous for us to go there now. But after the church is built it will be OK. So we hope to go next summer, if our Lord wills. The Besheno congregation has been recently adopted by the Family of Faith congregation in Ohio. 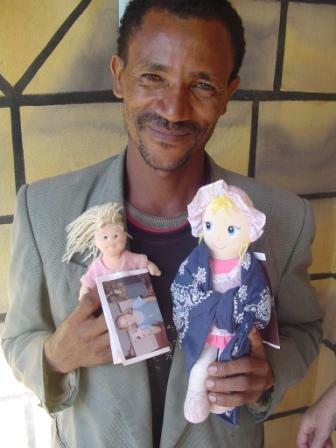 The founder and leader of the Besheno church is Tesfaye; it was his 8- year-old daughter who was murdered brutally just 18 months ago because of his Christian work. We were allowed the privilege of funding her burial and court costs. 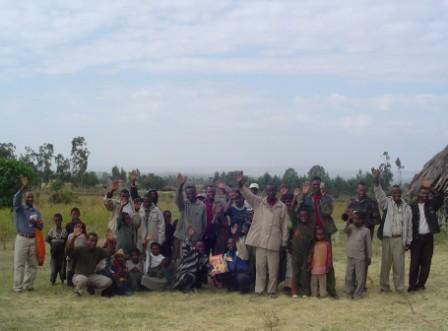 It is a 6-hour walk from Besheno to Alaba Town. This time when Tesfaye came to meet us, we presented him with a special gift for his two remaining daughters: the dollies of Olivia and Lydia Grace Meggs in Virginia. Once again, love reigned. 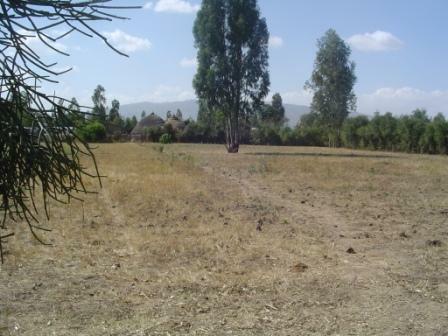 As these churches (Besheno, Bassa and Keranzo #1) are completed, will you give yourself to prayer? Pray that the Evil One will be prevented, that the workers will be kept safe, and that a strong testimony of our great God will be given in the process of building. There is one more church that we hope our Lord will build this spring. The name of this church is Zobechame. The Lord has been d oing a great work in this congregation for the past two years. Currently it meets in a little rented building. The government has confiscated all the buildings next to this property; the land has been cleared to build a public facility. But the owner of this building is resisting confiscation; little does he know that our Lord is buying time until He gives the congregation their own property. A “perfect” property has been located not too far from the current location. It’s about 7-10 acres, an almost perfect square, and the Muslim who owns it is willing to sell! He has given his asking price (about $15,000), but the church is getting the official government valuation of the property to lower the price. We will probably end up paying about $8-10,000 for the land. We visited the land. It is absolutely perfect! I noticed a really nice hut at the back side of the property; later I was told the story of that hut. It houses a very strong, influential witch doctor! This witch doctor is a young man. 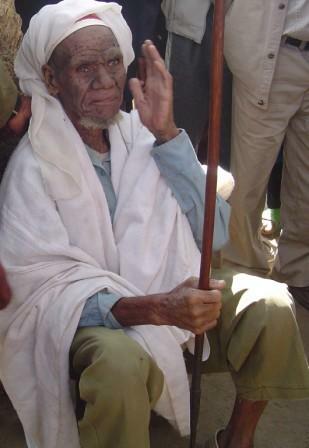 He is very well known; people come to him from all over Ethiopia. He’s very wealthy. Few people see him, but apparently he has very long hair. The interesting thing is that the witchdoctor moved to this sight only a few years ago. His previous site bordered on Town Church #2! As they were building that church, he would come and cast spells on the property and people. But our Lord is much stronger than his god! The witchdoctor eventually gave up and moved to Zobechame! Now another church is being built next to him! For many years believers in Alaba have been praying for the salvation of this man; perhaps that time has come. Will you join them in praying for the Light to enter his dark hut? We finished our time at Zobechame sitting on benches outside their rented building. 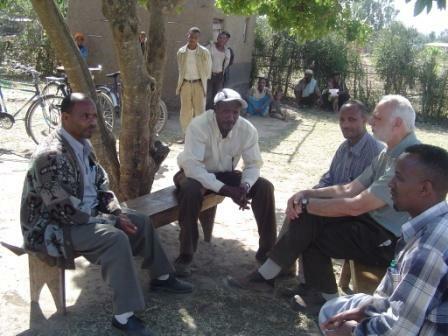 Around us sat a church leader, a Town Church evangelist, and a man named Getahun. Instantly my heart was bonded to this man. Let me tell you a little of his story. He came to Christ from a Muslim background. He married a girl who was also a Christian, but from an Orthodox background. They had one child, a son. Soon after this birth, his wife died. He had suffered severe persecution by his family, and he could not support his son. So the Orthodox parents of his wife are caring for the son. 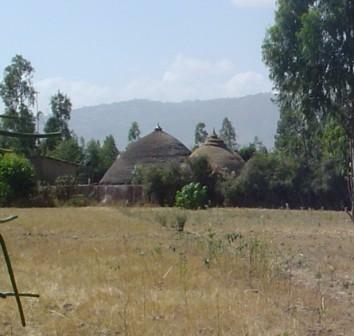 For many years Getahun has been living in the church building. He sleeps there. He guards the property. He provides janitorial services. And he teaches academic tutoring to a group of about 50 little children. His food is whatever food various believers share with him. And his clothes are whatever clothes people give him. This life of serving in poverty endeared him to me. We bought him new clothes, provided protein bars, and gave him money for medicine. I hope they will build him a simple hut near the new church so that he can continue his ministry. 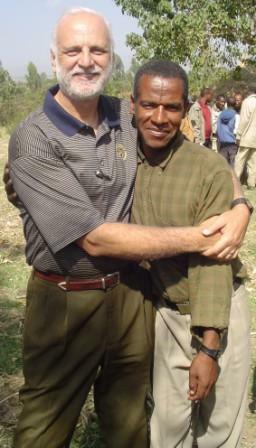 Please pray for Getahun; great is his reward in heaven because of his life of service to our Lord here. We have not yet advanced any money for the building of the Zobechame church. The congregation currently numbers 150 on a Sunday morning; they overflow the little rented building, fill the yard, and even the street. They need to move soon, and they need their own large meeting house. Please be in special prayer, that our Lord will give us the property at a good price, that the witchdoctor will come to Him, and that a building that honors Him will be erected in His time and way. Some believers in front of their rented building. Discussing the property with the leaders. Sharing stories of God's faithfulness. 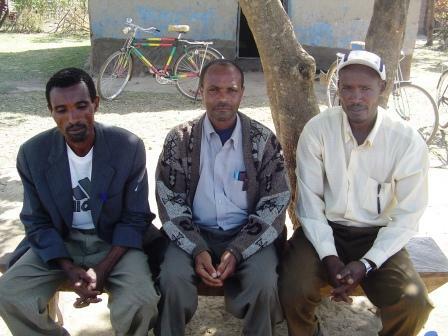 Getahun, a church leader, and an evangelist. Coming up next: Taking Care of Each Other.